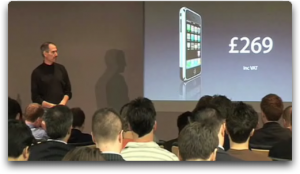 Crave TV posts a 13 minute hilights video of Steve Jobs at the London Apple Store launching the UK iPhone on September 18th. While there was live text coverage, watching the video itself provides a better feel for the event. Includes portions of the Q&A session where he talks about 3G, iTunes activation, iTunes Wifi store, Fair Usage limitations, Unlocked iPhones, iPhone pricing, and more.